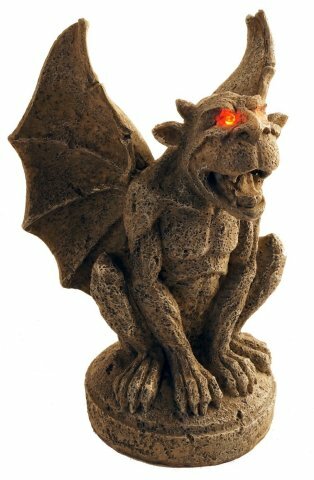 Decorate your home with accents from the Middle Ages for Halloween this year with gargoyle statues. You can choose between Small Creepy Halloween Gargoyles or Large Creepy Halloween Gargoyles. Both come with flashing red eyes to scare the pants off your guests. Originally these architectural features would have been referred to as "grotesques." True gargoyles were similar building decorations, but they were designed to channel rain water away from the buildings to prevent their erosion and deterioration. Over time all of these building features have become known as gargoyles. The smaller gargoyles come as a set of three with different chimerical animal designs. The statues are made of resin with realistic carved stone appearance. The flashing eyes are operated by an on/off switch. They make a wonderfully creepy touch to the darker corners of your home on Halloween. The larger gargoyles are sold separately and are similar to the smaller ones but approximately twice the size. Pair them with each other or with the small ones for a truly ghoulish effect. 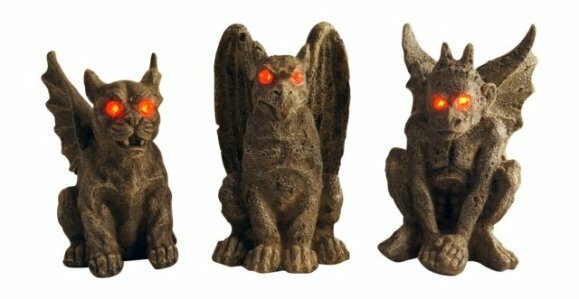 If these gargoyles are not quite what you are looking for, there are new offerings every year. So go and check them out. To find your perfect Halloween Gargoyles, click here. The Best Is Yeti To Come! Be A Cat This Halloween And Get Twitchy With It!